Anchorage of cells to "heparin" – binding domains that are prevalent in extracellular matrix (ECM) components is thought to occur primarily through the syndecans, a four-member family of transmembrane heparan sulfate proteoglycans that communicate environmental cues from the ECM to the cytoskeleton and the signaling apparatus of the cell. Known activities of the syndecans trace to their highly conserved cytoplasmic domains and to their heparan sulfate chains, which can serve to regulate the signaling of growth factors and morphogens. However, several emerging studies point to critical roles for the syndecans' extracellular protein domains in tumor cell behavior to include cell adhesion and invasion. Although the mechanisms of these activities remain largely unknown, one possibility involves "co-receptor" interactions with integrins that may regulate integrin function and the cell adhesion-signaling phenotype. Thus, alterations in syndecan expression, leading to either overexpression or loss of expression, both of which take place in tumor cells, may have dramatic effects on tumor cell invasion. The invasive and metastatic potential of a tumor cell relies on recognition of a variety of ECM ligands that control proliferation, dynamic cytoskeletal remodeling, apoptosis and gene expression. This recognition involves complex molecular mechanisms, beginning with the expression of specific matrix receptors, regulation of their activity, and reception and channeling of their signals into specific intracellular pathways. Additional complexity arises in that matrix ligands contain multiple adhesion receptor binding sites including sites recognized by both proteoglycans and integrins. In this sense, matrix ligands may be considered as "informational arrays" that function to modulate tumor cell phenotype by engaging specific combinations of cell surface adhesion receptors. Integrins are well recognized as matrix-responsive signaling receptors. Comprised of non-covalent heterodimers, the α and β integrin subunits collaborate in "inside-out" signaling that leads to "activation" of the receptor, classically defined as an increase in affinity for the matrix ligand resulting from a change in conformation of the integrin extracellular domain. However, integrins are also subject to "outside-in" signaling in which the ligand-bound receptor initiates intracellular signaling through association of the β subunit cytoplasmic domain with a myriad of intracellular effectors including focal adhesion and Src family kinases, cytoskeletal components such as α-actinin and vinculin and the Rho family of cytoskeletal regulatory G-proteins. However, this may be a simplistic picture of integrin signaling, as integrins are also known to signal in the absence of ligand binding [1–9] and integrin activity on cells is subject to cross-talk between heterologous integrin receptors such that final signaling output is not a simple additive function of all the integrins expressed on the cell [10–15]. Thus, an alteration in the integrin regulatory apparatus is likely to alter the metastatic potential of a cell. Cell surface proteoglycans (PGs) are also important in modulating cell adhesion and motility. Many adhesion-promoting components within the ECM – including structural proteins (laminin, fibronectin, collagen, etc. ), growth factors, chemokines and cytokines – as well as cell surface adhesion receptors (e.g. selectins, cell adhesion molecules (CAMs), etc.) support cell adhesion via binding interactions with PGs. The fact that PG binding sites exist in close proximity to integrin cell-binding domains within ECM molecules  and on other cell surface adhesion molecules suggest that cellular recognition of the ECM, or of counter-adhesion receptors on opposing cells, may involve the formation of receptor complexes that include both cell surface PGs and integrins. An implication of such a complex model of ligand recognition is that by concerted action PGs and integrins may alter each other's binding affinity for ligand(s) and consequentially, modulate distinct but overlapping signal transduction pathways within the cell. Accordingly, the nature of the intracellular signals transduced by a paired integrin and cell surface PG may be influenced by the specific integrin and/or cell surface PG core proteins expressed by a cell. Interactions between these two receptors may be direct (i.e. both receptors form a physical complex) or indirect (i.e. functional coupling – one receptor modulates the activity of the other receptor by an intermediate molecular mechanism). Understanding the nature of such physical or functional receptor complexes may help to explain cell-type specific functional differences that are often observed for a given integrin heterodimer. The syndecans are a four-member family of transmembrane cell surface PGs that bear heparan sulfate glycosaminoglycan (GAG) chains. The syndecans are expressed on virtually all cell types throughout development and adulthood, and their expression can be altered under certain pathophysiological conditions, including the processes of tumor onset, progression and metastasis [17, 18]. Their heparan sulfate chains endow these receptors with the ability to bind numerous "heparin" – binding growth factors and morphogens, for which heparan sulfate is an important regulator. The heparan sulfate chains also bind to "heparin" – binding sites present in matrix ligands, including fibronectin, vitronectin, laminins and the fibrillar collagens . As such, the syndecans are believed to have roles in cell adhesion and signaling, possibly as co-receptors with integrins and cell-cell adhesion molecules. The syndecan core proteins share a high degree of conservation in their short (ca. 30 amino acids) cytoplasmic domains and transmembrane domains; in contrast, the extracellular domains (also known as ectodomains) are divergent with the exception of consensus sites for GAG attachment (Figure 1). In the highly conserved cytoplasmic domains, a juxtamembrane C1 region is exactly conserved (with the exception of a conservative R for K amino acid substitution in syndecan-3) among the syndecan across all species and has been implicated in binding protein 4.1, e zrin, r adixin and m oesin (FERM) domains [20–23]. A C-terminal C2 region consisting of the amino acid sequence EFYA is present in all syndecans and binds to post-synaptic density 95, P SD-95; discs large, D lg; zonula occludens-1, Z O-1 (PDZ) domains in several proteins including calcium/calmodulin-dependent serine protein kinase (CASK) , syntenin , synbindin  and synectin . The intervening variable (V) region is distinct for each of the four family members, but its syndecan-specific identity is conserved across species. The function of this domain is largely unknown except in the case of syndecan-4 (Figure 2), where it is responsible for the assembly of syndecan-4 tetramers with PI-4,5-bisphosphate (PIP2) and activated protein kinase C-α (PKCα) in focal adhesions [28–34]. Overexpression of syndecan-4 leads to enhanced focal adhesion assembly and reduced cell motility, whereas syndecan-4 mutants which are unable to assemble into the PIP2/PKCα rich structures show reduced focal adhesion assembly and cell spreading as well as reduced motility [35, 36]. This assembly is regulated by fibroblast growth factor (FGF) signaling, which leads to serine phosphorylation of the C1 domain and failure to bind PIP2 [37, 38]. The syndecan-4 C1 and V regions also bind syndesmos, a paxillin binding protein that may serve to link syndecan-4 to the cytoskeleton . Alpha-actinin has also been shown recently to bind the V region of syndecan-4 . As it is unlikely that all of these interactions can occur simultaneously, one suspects that the syndecan may take on several different roles that change with cell activity. Syndecan Functional Domains. The syndecan core proteins display a high degree of conservation across species and across family members within their transmembrane and cytoplasmic domains, implying that some functional redundancy may exist among the family members. In contrast, the ectodomains of the syndecan core proteins are highly divergent both in size and sequence, indicating that this domain may confer separate and unique functions to each individual family member. Specific functions for the ectodomain of the syndecan core proteins are almost wholly unknown. 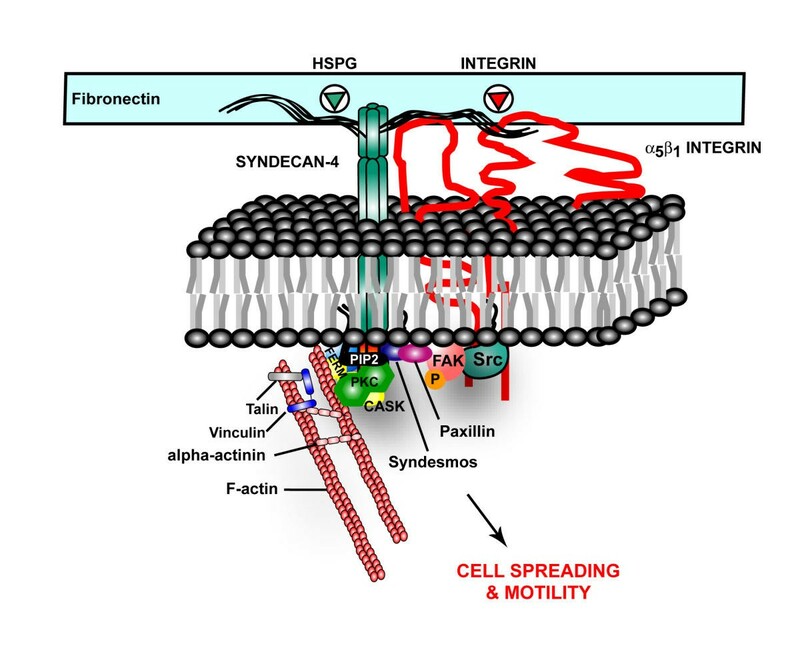 Syndecan-4 provides a mechanical link between the extracellular matrix and the actin cytoskeleton via binding interactions of its cytoplasmic tail. PIP2 binds to the syndecan-4 V-domain – an interaction that stabilizes syndecan-4 multimers against the inner leaflet of the plasma membrane and potentiates PKCα activity. The cytoplasmic tail also interacts with structural and signaling proteins such as CASK, FAK, syndesmos and paxillin. Interactions with these proteins may provide both a mechanical and signaling link to cell surface α5β1 integrins required for focal adhesion and stress fiber formation in cells adherent to fibronectin. Syndecan-4 may also link directly to the actin cytoskeleton through CASK, α-actinin and the FERM family of actin-binding proteins. Less is understood about the functional role of the V-domains of the other syndecan family members. However, the low degree of conservation within this domain amongst the four syndecans suggests distinct roles for the cytoplasmic domains of each of the syndecans in adhesion and signaling. Although less in known about the signaling capabilities of the other syndecans, data are emerging. Syndecan-deficient Raji lymphoblastoid cells when transfected to express syndecan-1 acquire the ability to bind and spread on syndecan-1 antibody or matrix ligands [41, 42]. This signaling depends on the transmembrane domain of the PG, which is found in specialized lipid domains, as well as a region within the syndecan-1 extracellular domain (McQuade and Rapraeger, submitted 2003). This unique finding suggests that the syndecan extracellular protein domains have important functions independent of, but most likely supplemented by, their attached GAG chains. Transfection of syndecan-1 in COS-7 cells also stimulates cell spreading, although the phenotype in these cells is characterized by fascin microspike formation and membrane ruffling . Fascin spikes are assembled in the absence of focal contacts and their assembly is dependent on the regulated activities of the small GTPases, Rac and Cdc42, as well as their downstream target p21-activated kinase (PAK) . Transfection studies with various syndecan-1 mutants mapped the active domain required for cell spreading to the ectodomain, although the V and C2 regions of the cytoplasmic domain are required for fascin spike formation. Syndecan-2, originally described as fibroglycan on fibroblasts where it has been implicated in matrix assembly , also has important functions in the nervous system where it participates in the formation of dendritic spines in neurons . Overexpression of syndecan-2 in cultured hippocampal neurons leads to precocious spine formation, an activity that is dependent on the cytoplasmic domain both for localization of the syndecan to the sites of spine formation and for interaction with ephrin B2 (EphB2) receptors that carry out an essential phosphorylation of the syndecan-2 . In COS-1 and Swiss 3T3 cells, syndecan-2 overexpression induces filipodial extension, which is dependent on activation of Cdc42 . Transfection studies with deletion mutants of syndecan-2 mapped the active domain required for filipodial extension to the ectodomain, although the cytoplasmic domain was required for co-distribution with F-actin – most likely via its binding interactions with the FERM protein ezrin . Intriguingly, in kidney derived epithelial LLC-PK1 cells, ezrin has also been shown to interact with and activate focal adhesion kinase (FAK), a scaffolding protein and cytoplasmic tyrosine kinase involved in cell adhesion, motility and survival . Moreover, interactions with the second "heparin" – binding domain (HepII) of fibronectin (type III12–14 repeats) is required for activation and stability of FAK and to maintain fibroblast cell survival [50–52]. These results suggest that molecular interactions of the syndecans involving organization of proteins within specialized sub-cellular structures have functional implications not only in regulation of cell morphology, but also in sustaining cell survival. Syndecan-3 (originally termed N-syndecan), which is also found in the nervous system, has a role in binding "heparin" – binding growth associated molecule (HB-GAM) in the outgrowing axonal tracts of the developing thalamocortical pathway [53, 54]. Neuroblastoma cells expressing syndecan-3 respond to HB-GAM by extending neurites in a signaling mechanism involving Src phosphorylation and syndecan-3 isolated from brain extracts co-precipitates with Src and Fyn, the Src substrate cortactin and β-tubulin [55, 56]. Syndecan-3 regulates N-methyl-D-aspartate (NMDA) receptor-mediated long-term potentiation (LTP) most likely via the activation of Src family tyrosine kinases, leading to enhanced LTP but impaired hippocampal-dependent memory in syndecan-3 null mice [57–59]. Syndecan-1 is highly expressed at the basolateral surface of epithelial cells where it is thought to interact with the actin cytoskeleton and to modulate cell adhesion and growth factor signaling [19, 60–62]. In experimental studies of malignant transformation, syndecan-1 expression is associated with the maintenance of epithelial morphology, anchorage-dependent growth and inhibition of invasiveness. Alterations in syndecan expression during development  and in transformed epithelial [64, 65] are associated with an epithelial-mesenchymal transformation with attendant alterations in cell morphology, motility, growth and differentiation. Transfection of epithelial cells with anti-sense mRNA for syndecan-1 or downregulation of syndecan-1 expression by androgen-induced transformation results in an epithelial to mesenchymal transformation and increased invasion [66–68]. The loss of E-cadherin under these circumstances has long suggested a coordinate regulation of syndecan-1 and E-cadherin expression [63, 69]. These studies, as well as others, indicate that there appears to be a threshold requirement for syndecan expression to elicit its biological activity. Syndecan-1 is downregulated in a number of epithelial cancers and in pre-malignant lesions of the oral mucosa  and uterine cervix [71–73], and its loss may be an early genetic event contributing to tumor progression [17, 74, 75]. Loss of syndecan-1 correlates with a reduced survival in squamous cell carcinoma of the head, neck and lung [76–78], laryngeal cancer [79, 80], malignant mesothelioma  and multiple myeloma  and a high metastatic potential in hepatocellular and colorectal carcinomas [83–86]. Downregulation of syndecan-2 and -4 expression has also been observed in certain human carcinomas [78, 87–89], but the functional consequences of these alterations in expression are less clear. In contrast to the general notion that the syndecan may be an inhibitor of carcinogenesis, syndecan-1 also demonstrates tumor promoter function. Syndecan-1 supplements Wnt-1 induced tumorigenesis of the mouse mammary gland  and promotes the formation of metastases in mouse lung squamous carcinoma cells . Enhanced syndecan-1 expression has also been observed in pancreatic , gastric  and breast [93–95] carcinomas and this overexpression correlates with increased tumor aggressiveness and poor clinical prognosis. This duality in the role of syndecan-1 in tumorigenesis may reflect tissue and/or tumor stage-specific function, or reflect the multiple functions of this PG. Sanderson was the first to demonstrate a role for syndecan-1 in tumor cell migration by examining the invasion of myeloma cells into collagen gels . Ectopic expression of syndecan-1 in syndecan-deficient myeloma cells had the striking effect of curtailing invasion, whereas the expression of other cell surface heparan sulfate PGs (e.g., glypican) was without effect. Using chimeras derived from these two proteins, Sanderson showed that the activity of the syndecan is preserved when its ectodomain alone is expressed as a glycosyl-phosphatidylinositol (GPI)-linked protein at the cell surface. Although clearly responsible for binding the collagen matrix via its attached heparan sulfate chains, the anti-invasive activity of the syndecan requires yet an additional interaction that traces to a site in the extracellular domain of the core protein itself. The mechanism by which the ectodomain site influences the invasion of the myeloma cells is unknown, but its interaction with other cell surface receptors in a "co-receptor" role is one possibility. More recently, ectopic expression of syndecan-1 has also been shown to curtail the invasion of hepatocellular carcinoma cells into a collagen matrix . In a recent study examining syndecan-1 in epithelial cells, we have shown a critical role for syndecan-1 in αvβ3 integrin signaling activity (Figure 3) . Most mammary carcinoma cells express multiple syndecan family members (e.g., syndecan-1, syndecan-2, syndecan-4) as well as other cell surface heparan sulfate PGs (e.g., glypican-1). Because adhesion via heparan sulfate to matrix ligands is likely to simultaneously involve all of these receptors, the use of core protein-specific antibodies is the only reliable way to study the adhesion-signaling role of a specific syndecan. This also allows investigation of the syndecan-mediated adhesion without ligand engagement by integrins that would otherwise also participate in binding to a matrix ligand. Employing this procedure with MDA-MB-231 cells, a highly invasive human mammary carcinoma cell line that endogenously expresses syndecans-1 and -4, demonstrates that the cells strongly adhere to mAb B-B4 (specific for human syndecan-1) but fail to spread in response to the syndecan ligation. This result was intriguing for several reasons. First, these cells are mammary epithelial cells – a cell type in which it is known syndecan-1 functions to regulate cell morphology . Second, it contrasts with studies with other cell types (e.g., Raji, myeloma, COS, etc.) 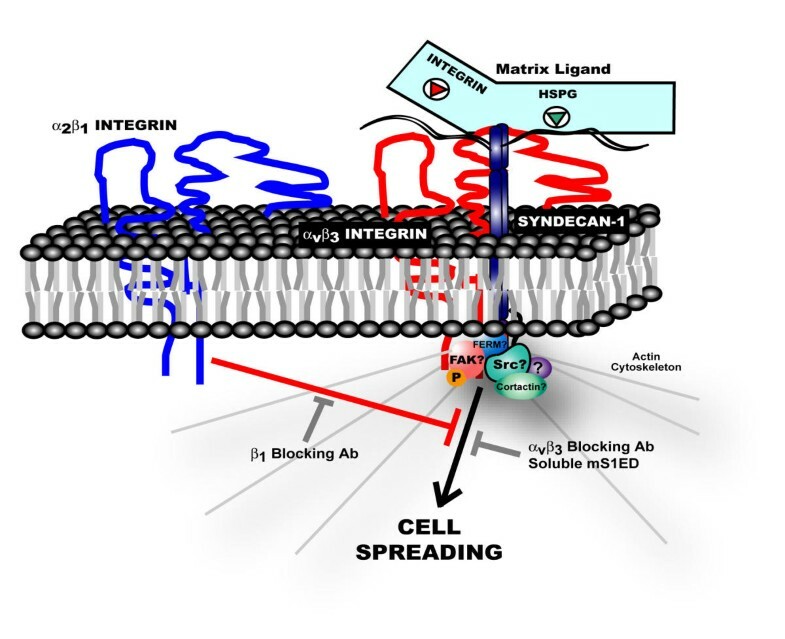 in which adherence via syndecan-1 leads to an active signaling and spreading process. Finally, the cells do spread when plated on the HepII domain of fibronectin, which can engage multiple cell surface PGs, or in response to syndecan-4 ligation. As MDA-MB-231 cells adherent via syndecan-4 spread and cells adherent via syndecan-1 do not, these results indicate that syndecan-1 and -4 may trigger different signaling pathways and that the syndecan-1 adhesion-signaling pathway may be missing or selectively shut-off. Syndecan-1 adhesion-mediated signaling in human mammary carcinomas. In response to syndecan-1 ligation, αvβ3 integrins and syndecan-1 form a signaling complex that regulates cytoskeletal reorganization. Cells initially fail to spread in response to syndecan-1 ligation because signaling downstream of this complex is negatively regulated by activated α2β1 integrins. Treatment of cells with a neutralizing β1 integrin antibody relieves this inhibitory signal allowing cells to initiate a spreading response. Intriguingly, signaling occurs in the absence of an integrin ligand suggesting that syndecan-1 participates in the allosteric activation of αvβ3 integrins. While activated αvβ3 integrins are required for signaling (i.e. spreading is blocked by αvβ3 integrin blocking antibody), molecular interactions of the syndecan-1 core protein are also required as signaling is blocked by soluble m urine s yndecan-1 e ctod omain (mS1ED). In our model, the syndecan physically associates with the αvβ3 integrin via an ectodomain interaction, although a functional coupling via an indirect mechanism has not been ruled out. 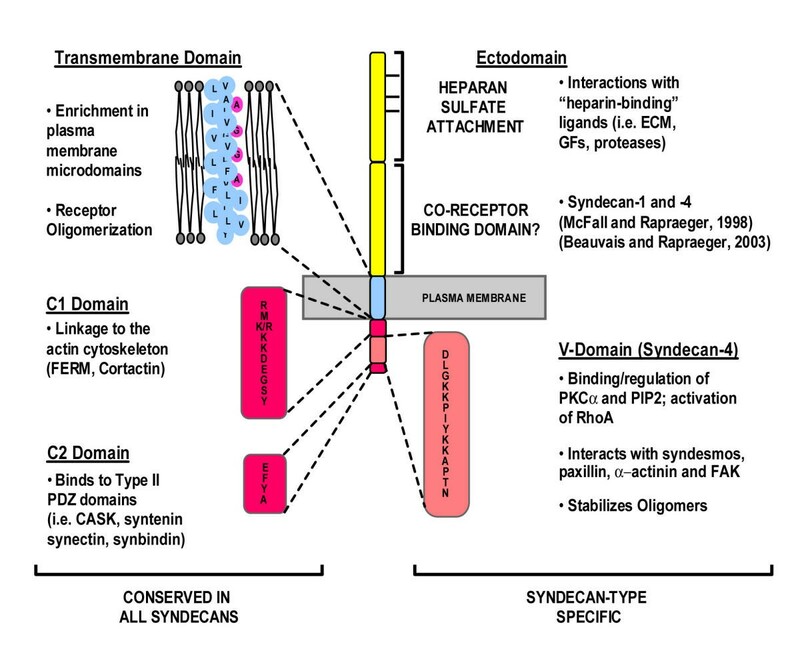 Further, while our data suggest that the syndecan's transmembrane and cytoplasmic domains are not absolutely required for signaling, the possibility that these domains may have important regulatory roles cannot be excluded. What does it take to turn the syndecan-1 signal on? Despite their initial failure to spread when adherent via syndecan-1 alone, MDA-MB-231 cells do spread if treated with 1 mM manganese (Mn2+). As Mn2+ induces conformational shifts that mimic the physiological activation of β1 and β3 integrins, these results indicated that it might be necessary to activate one of the β1 integrins, or the αvβ3 integrin, on these cells as an integrin partner working in collaboration with syndecan-1 ligation. The identity of which integrin(s) cooperate with syndecan-1 was determined using modulatory antibodies to induce conformational shifts that mimic the active or inactive states of a particular integrin. These studies revealed that activation of β1 integrins is not required for syndecan-1 mediated cell spreading. In fact, inhibition of β1 integrins induces cell spreading – presumably by releasing the integrins'-dependent suppression of the syndecan. Use of other integrin modulatory antibodies demonstrated that syndecan-1 collaborates with the αvβ3 integrin to initiate a positive spreading signal and that trans-dominant inhibition arising from an α2β1-αvβ3 integrin cross-talk prevents this signal from being generated. Intriguingly, cooperative signaling via αvβ3 integrins occurs in the absence of an integrin ligand (i.e. syndecan-1 ligation is sufficient) – a contention supported by evidence from other published works that unligated integrins are capable of transmitting intracellular signals both in vitro and in vivo [1–9]. What role, syndecan-1 plays, if any, in the allosteric activation of αvβ3 integrins is presently unknown. However, our current work indicates that ectopic expression of murine syndecan-1 can block β1 integrin function in human mammary carcinoma cells (Burbach and Rapraeger, in preparation). As such, the failure of MDA-MB-231 cells to initially spread may trace to sub-optimal levels of cell surface syndecan-1 expression and as a consequence, hyperactivation of β1 integrins. In fact, MDA-MB-231 cells overexpressing human or murine syndecan-1 are capable of spreading in response to syndecan-1 ligation in the absence of β1 integrin blockade (unpublished work). An important feature of the syndecan necessary for signaling appears to be its ectodomain. Specific evidence supporting a role for the ectodomains of syndecan-1 and -4 in cell adhesion has previously been described in our laboratory [99, 100]. Soluble murine syndecan-1 ectodomain competitively inhibits MDA-MB-231 cell spreading in a dose-dependent manner. This competition is specific for syndecan-1, as soluble syndecan-4 ectodomain fails to compete. These results suggest that soluble murine syndecan-1 competes with the endogenous human syndecan for a critical cell surface interaction required for signaling during cell spreading. Indeed, expression of a syndecan-1 mutant, in which a portion of the ectodomain is deleted, fails to signal spreading, while deletion of the syndecan-1 transmembrane and cytoplasmic tail is without effect (unpublished work). These results indicate a regulatory role for the syndecan-1 ectodomain in the regulation of epithelial cell morphology, in agreement with earlier published works [67, 101]. Upregulation of syndecan-4 has been noted in hepatocellular carcinomas and malignant mesotheliomas [102, 103] and such overexpression may correlate with increased tumor cell proliferation [104–106]. Additionally, syndecan-4 has been shown to enhance β1 integrin function. Mesenchymal and epithelial cells when seeded on an heparan sulfate-specific ligand, the cysteine rich domain of a d isintegrin a nd m etalloprotease, ADAM-12/Meltrin α (rADAM12-cys), cells will bind and spread in a manner that requires signaling by both syndecan-4 and β1 integrins [8, 9, 107]. These results imply that the syndecan can trigger signaling cascades required for cell spreading either by exposing a cryptic binding site for β1 integrins, as has been proposed for fibronectin , or by modulating the activity of β1 integrins. Interestingly, colon carcinoma cells attach but fail to spread on aADAM12-cys. However, exogenous stimulation of β1 integrins with 1 mM Mn2+ or β1 integrin function-activating antibody induced cell spreading, suggesting that in transformed cells the ADAM-12-syndecan-4 complex fails to activate β1 integrins. The molecular mechanism required for syndecan-β1 integrin receptor cross-talk involves, in part, syndecan-4 dependent activation of PKCα and this activation is required for cell spreading . Additional effectors required for cell spreading which are activated downstream of the syndecan-integrin signaling complex include Rac1 and the lipid kinase, phosphoinositide 3-kinase (PI-3K; Dr. Charles Thodeti, personal communication); activation of RhoA is required for stress-fiber formation, but not for cell spreading . ADAM-12 has been implicated in the differentiation and fusion of skeletal myoblasts [109–111] and its expression is dramatically upregulated in a number of carcinomas . Further, the cytoplasmic tail of ADAM-12 interacts directly with the actin cytoskeleton via α-actinin [112, 113] and contains several Src homology 3 (SH3) binding motifs which have been shown to interact with and stimulate the activity of Src tyrosine kinase, the adaptor protein growth-factor receptor-bound protein-2 (Grb-2) and PI-3K [114–116]. These results indicate that ADAM-12-syndecan signaling complexes may regulate cell adhesion and migration during the processes of development and metastasis. Syndecan-2 has been implicated in two emerging cancer scenarios. One involves a role in fibronectin assembly, focal adhesion formation and migration in Lewis Lung carcinoma cell variants. The second is a role in adhesion and proliferation of syndecan-2 overexpressing colon carcinoma cells. The P29 and LM66-H11 cells are two cell-culture variants derived from the rat Lewis lung carcinoma. The P29 cells represent a low metastatic tumor that induces a potent host-stroma response leading to the accumulation of a fibronectin-rich stromal matrix in vivo [117, 118]. In vitro, the P29 cells attach to fibronectin and respond to this matrix ligand by assembling focal adhesions and actin stress fibers [119, 120]. This is reminiscent of focal adhesion assembly typically seen by most cells that employ fibronectin-binding integrin (usually α5β1) and syndecan-4, which is responsible for binding PKCα and PIP2 via its unique cytoplasmic domain. In the P29 carcinoma cells, however, there is a distinct requirement for syndecan-2, which is the syndecan family member most closely related to syndecan-4. This requirement is best illustrated by the H11 variant that expresses reduced levels of syndecan-2 at the cell surface compared to the P29 cells . These cells do not form focal adhesions or stress fibers on fibronectin. The cytoskeletal morphology of the cells mimics that observed of the same cells plated on the cell-binding fragment of fibronectin alone (i.e., assemble cortical actin in response to α5β1 ligation by the fibronectin), but show little response to the "heparin" – binding domain of this matrix ligand. Importantly, this failure takes place despite the expression of syndecan-4. This suggests that syndecan-2 is a critical component in the signaling pathway that relays adhesion to fibronectin into cytoskeletal assembly. This hypothesis is further supported by the finding that plating the P29 cells on a substratum consisting of the cell-binding domain of fibronectin supplemented with syndecan-2 core protein antibody leads to focal adhesion and stress fiber formation, in the apparent absence of syndecan-4 ligation. In addition, increasing the expression of syndecan-2 in H11 cells restores their ability to assemble focal adhesions on fibronectin and blocking syndecan-2 expression in the P29 cells using anti-sense oligonucleotides reverts their phenotype to that of the H11 cells [119, 120]. What does this mean? It seems clear that syndecan-2 and syndecan-4 can have overlapping roles, even though the role described for syndecan-4 in binding activated PKCα in focal adhesion seems unlikely to be duplicated by syndecan-2. One unanswered question is what role syndecan-4 plays in Lewis lung carcinoma cells. Is its participation in the adhesion-signaling pathway at all required? Perhaps the syndecan-4 protein is partially activated or inactivated and signaling through syndecan-2 complements and completes the signal. Alternatively, syndecan-4 may be relegated to a non-functional state that allows syndecan-2 to supplant its function. This scenario is reminiscent of findings from the syndecan-4 null mouse in which syndecan-2 may compensate for the loss of syndecan-4 in fibroblast focal adhesions . What function has been supplanted? At present, data suggest that syndecan-2 cytoplasmic domain does not have the ability to bind PIP2 or activate PKCα, functions ascribed to syndecan-4 alone. Thus, other functions of the syndecan core protein and/or its heparan sulfate chains must be taking place, functions that may include interactions with the integrin itself, or modify the integrin adhesions through assembly of the fibronectin, a role for which syndecan-2 is becoming known. Syndecan-2 is often over-expressed by 2–5 fold in colon carcinoma. This overexpression, which induces to a rounded adhesion phenotype and piling-up of cells in culture [87, 122], also correlates with an invasive phenotype . Reduction in syndecan-2 expression by treatment with trichostatin A, a specific inhibitor of histone deacetylase, converts the cells from this transformed phenotype to flattered monolayers that display an organized cytoskeleton [87, 122]. The transformed cells also display enhanced cell proliferation and growth in soft agar, which, interestingly, can be blocked by adding exogenous, soluble syndecan-2 extracellular domain or by reducing syndecan-2 expression with anti-sense oligonucleotides . This causes rounding of the adherent cells, G0/G1 cell cycle arrest and reduction in epidermal growth factor (EGF)-stimulated extracellular signal-regulated kinase (ERK) activation, thus dramatically reducing cell growth in soft agar. Syndecan-4 ectodomain is without effect. Intriguingly, ectodomain of syndecan-2 is also without effect on colon carcinoma cells that do not overexpress syndecan-2. This suggests that overexpression of syndecan-2 leads to an altered signaling phenotype that traces in part to its extracellular protein domain. Fundamental to the process of tumor cell metastasis is dynamic, and often rapid, regulation of cell surface adhesion receptors and commensurate rearrangement of the actin cytoskeleton. However, the mechanisms by which tumor cells modulate integrin adhesiveness are not fully understood. Many ECM ligands contain closely spaced proteoglycan- and integrin-binding domains, suggesting that these two types of adhesion receptors function in concert to stimulate cytoskeletal reorganization, migration and invasion. The mechanism by which syndecans can act as co-receptors with integrins remains unknown, but recent studies point to the syndecan extracellular protein domains, that appear to complement the binding interactions of their attached heparan sulfate chains. In addition, these interactions are likely to supplement activities of the conserved transmembrane and intracellular domains, through which syndecan adhesion-mediated signaling cascades may alter or amplify integrin-mediated signaling pathways. Understanding the mechanism(s) by which the syndecans participate in this signaling may lead to novel therapeutic strategies to control tumor cell invasion and metastasis.